Getting married is a wonderful thing but damn if it isn’t expensive! As if paying for the wedding wasn’t enough of a struggle, you’ve also got to figure out how to afford a worthy stag do. 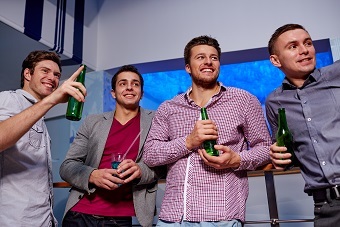 It can seem overwhelming but don’t stress because we’ve got some cheap stag do ideas that will save you money without compromising on the fun factor. The man vs food burger challenge stag do is cheap as chips and a great laugh. See if you’re man enough to take on the challenge of devouring a monster burger in under 60 minutes. Everyone can attempt the challenge and its great banter watching the groom frantically stuff his face. The Bierkeller show stag do is an amazing activity, not just for the price, but in its own right. A totally unique Bavrian themed booze fest where everything’s bigger & better. Snack on giant pretzels and wash them down with a huge stein glass of quality German lager. With live music and table service from lovely ladies the Bierkeller show stag do has it all. If you’re looking for something a little more active and with no chance of giving you a beer belly, you might like to opt for the 5 a side football stag do. No twists, just the classic game of footy you know and love. The event is fully co-ordinated so no cheating! Remember, you don’t have to go out all out for an awesome stag. Sometimes a kick about with mates is all you need. The smartphone treasure hunt stag do is fun and simple day out where all you need is a fully charged smartphone with the treasure hunt app downloaded on it. You and your mates will walk around the city, unlocking quizzes and challenges as you go via GPS. The group will need to complete these challenges while enjoying a few drinks en-route. All these activities cost next to nothing and the fun-factor make them well worth the money. See all of our stag do activities here. Give us a ring on 0161 341 0052 for more info.